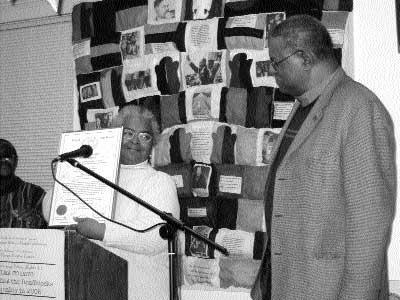 In a moving presentation, New Haven Alderwoman Dolores Colon delivered a city proclamation, signed by all New Haven Board members, to Tyner in honor of his dedicated and courageous work for civil rights.Professional musician Michael Mills and Drums No Guns Commission Inc. opened with African drumming that reached the heart and soul of everyone who filled the New Haven People’s Center. Emanuel Gomez, a retiree from Winchester and member of the Machinists union, wrote and recited a special tribute to African American men and women. Giving an inspiring call to action against the Bush administration’s attempts to dismantle civil rights, Tyner emphasized that more grassroots organizing and bigger coalitions are required. Despite major efforts to suppress the Black vote in 2004, the massive African American turnout and 89 percent vote against Bush is “a tribute to the leadership of Black workers and the multiracial U.S. working class in general,” said Tyner. Tyner stressed the importance of voting in every election and guaranteeing everyone’s vote is counted. “African Americans have a long history of fighting for the right to vote and using that right to fight for their freedom. And while every generation of youth has to be won to this idea it is deeply imbued in the spirit of the people,” he said. In his speech, Tyner recalled the well-organized, massive voting rights struggles in the South in the 1960s. Dismantling the remaining roadblocks to equality will take participation from everyone, Tyner said. The event raised nearly $2,000 for the People’s Weekly World.